As soon as this soup starts simmering, you’ll see (and smell) why this was one of my grandmother’s best recipes, and one of my favorites. The key, as always, is to use good stock and to let it simmer for a while to marry all of the flavors. You can use any type of fresh mushroom for this recipe; I had a lot of oyster mushrooms and creminis in my CSA box, so that’s what I used. I would just stay away from any canned mushrooms because they will be extra chewy in this slow-cooked soup. Also, I use a good chicken stock, but if you want to keep this recipe vegetarian, simply use vegetable stock or mushroom stock instead. Personally, I like the additional flavor from the chicken in this soup. And don’t skimp on the garlic – it’s one head of garlic, not one clove. That’s not a typo! Also, a quick word about the barley: use caution. I’ve heard more horror stories this week about a soup that should have been good, if only it hadn’t become a huge blob of sticky barley with a few slices of carrot in between. One cup of dried barley — pearl or regular — cooks to THREE CUPS of cooked barley. 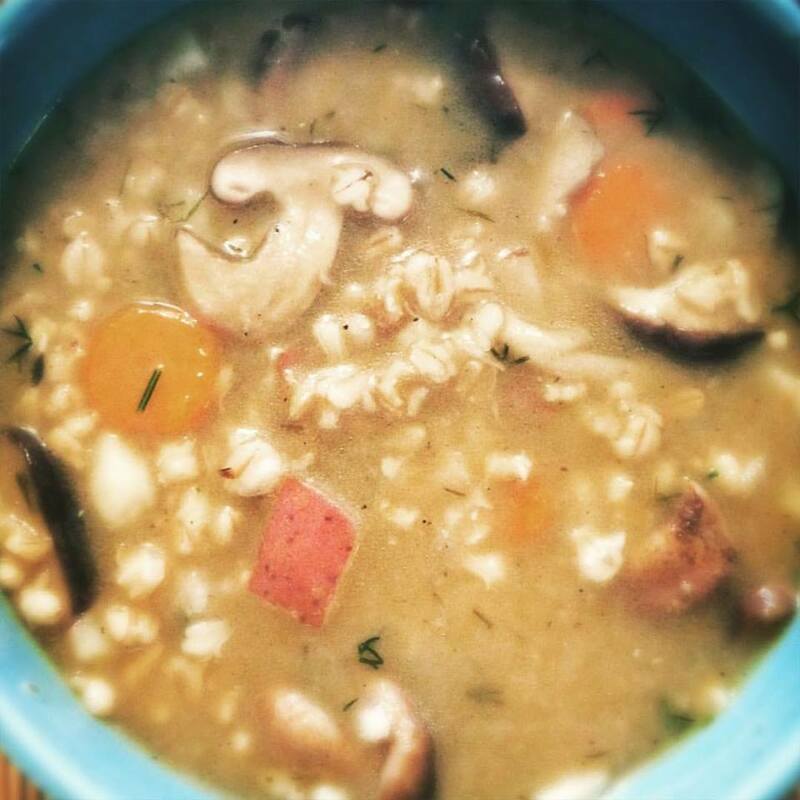 This recipe is for 6 servings of soup, and uses only one cup of dried barley. And it’s plenty. Of course, if your leftovers happen to be too thick, simply add a bit more stock, reheat, and you’ll be fine. First, start to sautee the garlic and onion in a large pot and cook until fragrant. Add the carrots, potatoes and parsnip, add more oil if needed, and season with salt and pepper. Cook for 1-2 minutes, then add a quart of the chicken stock and the barley. Bring to a boil, then add the mushrooms. Reduce the heat and cover, then let simmer for about 30-40 minutes, or until the barley is cooked. Taste the soup, add more salt and pepper or more stock if needed. Sprinkle on fresh dill and serve hot. Save or pin this recipe card! 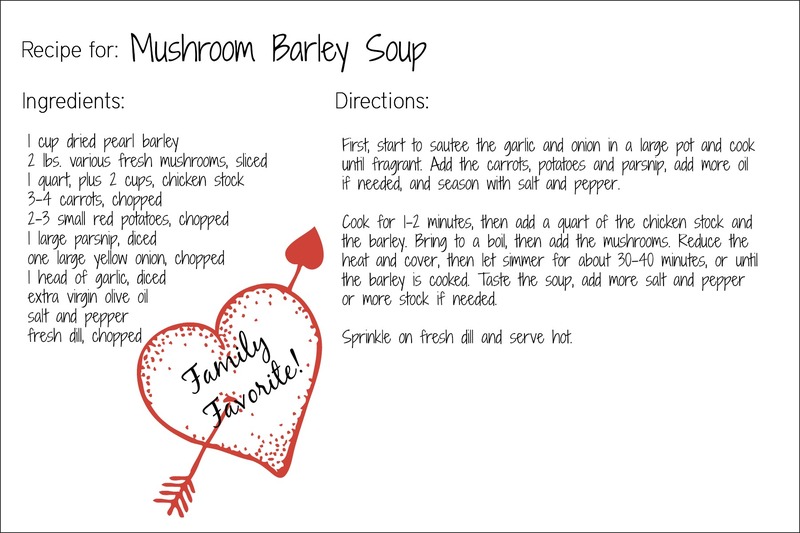 This entry was posted in cooking, food, leftovers, October Unprocessed, soups and stews, Uncategorized, unprocessed, vegan, vegetarian and tagged barley soup, mushroom barley soup, vegetarian soup. Bookmark the permalink.